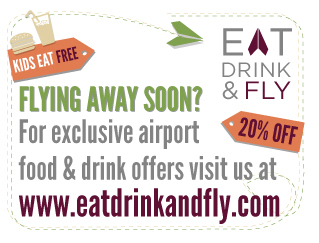 Madrid is said to have the greatest number of bars and restaurants per capita of any city in the world. Not for nothing are Madrileños known as “Gatos”, or cats, based on the fact they hardly sleep. Finishing work at 9, they make for the nearest Tapas bar, where they have a drink and a snack, and then move on to the next. They keep going until around 11pm, when they stop for dinner, then it’s off to a disco, flamenco club, or bar. That’s the story anyway, so I decided to give it a go: not the working or the dancing, but the Tapas part. I was ably guided by Susana Jarabo who knows everything there is to know about Madrid. 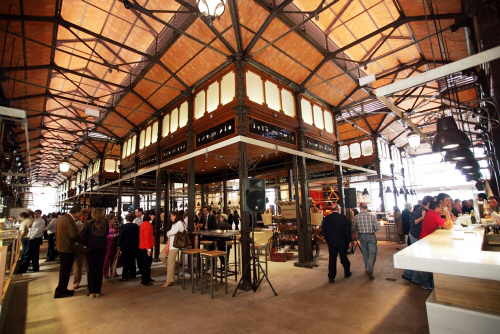 What better place to start than this iron and glass traditional market? It opened in 1916 but gradually fell into disrepair as the area changed and was about to be demolished. In 2003, private investors came to the rescue and it underwent full restoration. 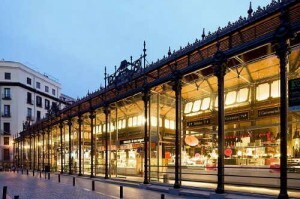 During the day it functions as a food market but in the evening its bars and restaurants make it the place to meet in old Madrid. Ironically for a night of Spanish Tapas. we started the evening with half a dozen French oysters and a glass of Champagne at the Daniel Sorlut bar, struggling through the crowd to get served. 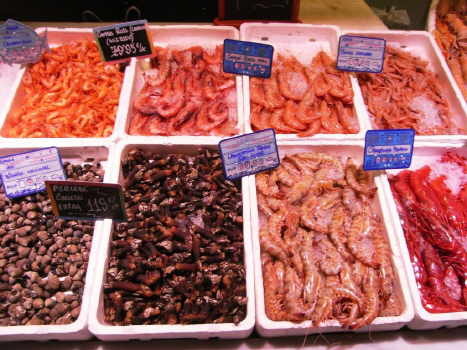 There’s a buzz about this market, and I would have gladly stayed, but we had to move on, there were Tapas to kill. 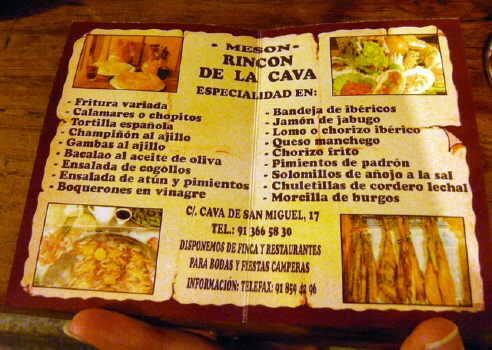 Less than a five minute stroll away is the traditional Meson Rincon de la Cava. 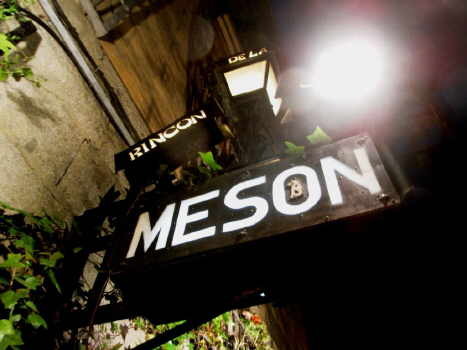 Meson means cellar and the inside is divided into small intimate dungeon dining rooms. This is traditional food at its best and we had a plate of meat – Lomo, Jamon, Chorizo and cheese with crispy ham and cheese croquettes followed by a Spanish Omelet. Normally this is a dish to avoid, often a plate of Spanish stodge, but this was freshly prepared and light and fluffy. I’m now a convert. An excellent bottle of dry white Verdejo washed it all down. Next it was a stumble across Plaza Mayor, the historic centre of Madrid, pausing for a quick snack at Casa Rua. The square is lined with restaurants but this is the place where Madrileños refuel. They come for the Bocadillo de Calamares or deep fried Squid sandwich, which they’ve been serving since 1940, and it’s tasty and cheap at 2.65 Euro. 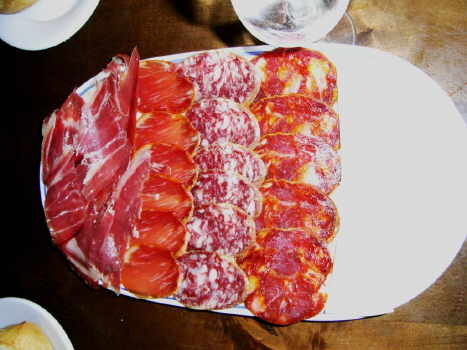 Other Tapas looked just as appetizing but we were on a mission and couldn’t linger. A few minutes later we were in Plaza Santa Ana, the heart of the literary district, known as Barrios de las Letras. 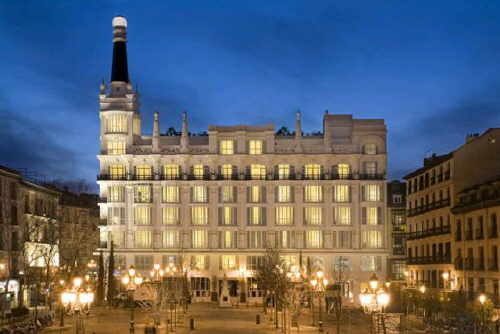 Cervantes, Lope de Vega and other celebrated writers lived here, and Ernest Hemingway liked to stay at the Hotel Reina Sofia, right on the square. Matadors would change into their costumes inside before parading in open-topped cars to the bull ring. 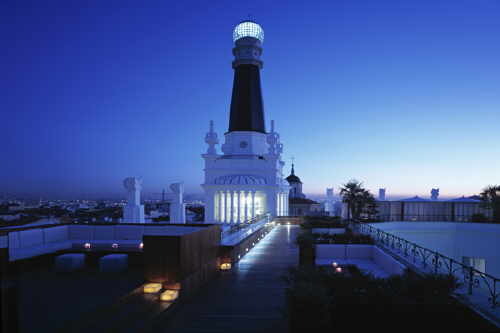 It’s now been refurbished and renamed as the chic ME hotel and the spectacular rooftop terrace bar, the Penthouse, is the place to sip cold Cava and enjoy splendid night time views across Madrid. Our budget didn’t stretch to more than one drink and, fortunately, we were still hungry. 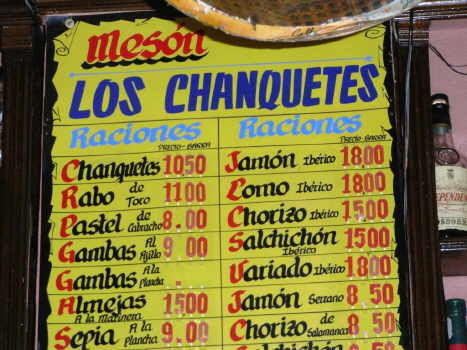 Back on the streets we headed for Los Chanquetes, popular with locals and tourists alike. Surrounded by, bullfight posters and portraits of famous matadors, this white tiled restaurant feels like the heart of the real Spain. It gets its name from the little fried fish called Chanquetes and they’re the stars of the Tapas menu, crunchy, smaller than white bait and far tastier. Mega Tapas portions of Cod with Tomatoes, Pepper Croquettes and slow cooked Oxtail filled us to bursting. Feeling as we couldn’t eat any more, we struggled with the desert Tapas at this trendy bar. It’s just across from the Prado, and the barrel shaped ceiling is lined, delightfully, with those elaborate combs that Spanish women use to prop up their mantillas. 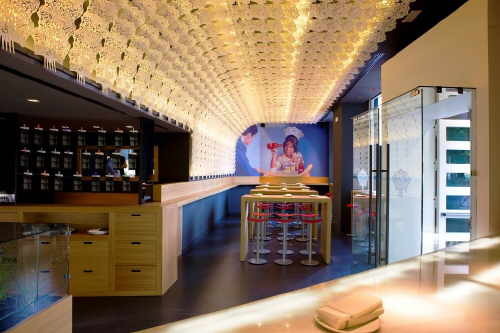 Estado Puro means “pure state,” which gives you an idea of what the chef Paco Roncero is up to. He has his own take on such classics as Cuajado de Chocolate (Chocolate Yogurt Cake), Pastel de Requesón y Membrillo (Quince and Curd Tart) and Tarta San Marcos (Sponge covered in Syrup and Custard) but it was all too much. For the locals a Tapas crawl is just the precursor to a hearty dinner but we had to settle for coffee, completely Tapassed out. It must be in the genes, we were failures as Madrid Cats and more like British Rats leaving a sinking ship.